I can’t count the number of times I’ve spoken to individuals who have expressed to me their interest in building a pond. Whether it’s on land they own or on land they intend to own, it seems like everyone wants a pond. I can’t say as I blame them. Ponds are wonderful for any number of reasons. Great private fishing, attraction of wildlife, swimming hole, livestock water supply, irrigation water supply… the list goes on and on. Usually I most often encounter this when out showing property. When a lot of folks realize that it is generally much more expensive to buy property with a pond than property without a pond they decide it must be a better decision to build one. So is it? Can’t I just dig a hole and let it fill up? These three things will determine, not only how big your pond can sustainably be, but also whether you can have a pond or not. Geology is imperative as it pertains to the types of soil in your desired pond site. Thick clays are the most impermeable of soils and as such make by far the best soil substrates for pond building. Soils that are predominantly sandy or full of gravel make extremely poor pond sites as they are extremely permeable and result in a great deal of seepage. With high enough levels of seepage, you’ll have an extremely difficult time maintaining water levels without a great influx of water. Even then, the high turnover of the water will result in a pond poorly suited for game fish. Topography is important in determining both where you can site a pond as well as determining what type of pond you should build. There are three main types of ponds; embankment, excursion and combination. The embankment pond is the cheapest and most common form of pond I see in my area of Georgia. It involves building a dam between two steep hillsides and allowing the runoff/watershed behind it to fill. It results in the waterline rising above the current ground level to create your pond. As the greatest cost in constructing a pond is in earth moving, the small amount of excavation and earth moving involved in this type of pond makes it extremely cost feasible for most individuals so long as they have the proper topography. Excursion ponds are in essence excavating a portion of ground beneath the current ground level and filling it with water. These ponds can be very expensive and are often of fairly uniform depth and typically more shallow due to the costs of construction. As they are typically built on level parcels of land they can be built in areas where embankment ponds cannot, but they suffer from some problems usually related to water sources. Combination ponds are merely a combination of the two methods used above. Water Sources are the final basic piece for pond building. 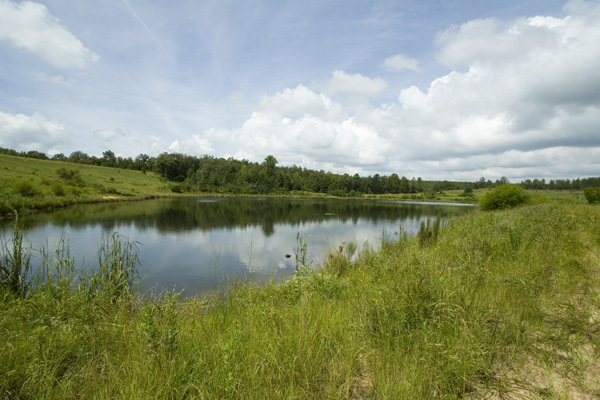 There are three types of potential water sources for a pond. Runoff/watershed, ground water and surface water. Runoff/watershed can be quality ponds if the watershed is sufficient for your pond size. The biggest determining factor is how much watershed do you have and how big do you want your pond? If your watershed is grassy field, you can get by with as little as 5 acres per surface acres of water. In some areas with very permeable soil, that is perhaps in cultivated fields, it may require several hundred acres per suface acre of water to be a sufficient watershed. Ground water is basically pumped well water. Often used in conjunction with excursion wells, it can be quite an effective water source but it often lacks sufficient nutrients for quality fish development with a good deal of pond fertilization and the pumping costs can get expensive. Surface water can be a good quality source of water for ponds. The biggest limiter here is the amount of surface water you’re trying to contain. Contrary to intuition, the smaller amount of water is generally better. A small spring can be controlled by a dam much more easily than a briskly flowing stream. A stream’s level can vary drastically depending on the amount of rainfall. This means any dam one construct’s must be sufficient to deal with water intake at its maximum. This can raise the cost of construction significantly. So with all this in mind, what does it cost to build a pond? Well, it depends on the factors listed above. As a general rule you can figure it will run anywhere from $10,000 per acre and up for smaller ponds and from $2,000 to $5,000 per acre and up for ponds over 10 acres. This price will vary drastically based on the above factors and the amount of earth moving required. One must also consider the tremendous amount of permitting required before one begins building. The permitting process can be extremely onerous. Far more onerous than I want to get into here. You can go to the Georgia Environmental Protection Division for the particulars if you want to look around or you can go through this handy and lengthy PDF that covers most of the details of pond building permitting required in Georgia. A pond is a wonderful asset to have and is well worth the cost to build. However, it’s not an endeavor to be entered into lightly. As long as one does plenty of pre planning you’ll find it well worth the investment. Despite all the cost and aggravation that can be involved, a well done pond is worth it’s weight in gold for both enjoyment and future resale value. This entry was posted in Fishing, Georgia land for sale, georgiacountry.com, Investment, Outdoorsman, Ponds and tagged fishing, georgia environmental protection division, Georgia land for sale, georgiacountry.com, Investment, land, outdoorsman, pond construction, ponds. Bookmark the permalink. I am looking for someone to construct a large pond near Lincolnton, GA. Any suggestions where to start?